Would you like to share your business services and/or expertise with 10,000+ women on Business Social Network Sites? There are thousands of women who need quality services and coaching, but they are unaware about you and your business. Research indicates that one of the keys to marketing on the Internet and attracting customers is to “provide valuable information”. If you would like to write a business article to attract customers, here is your chance to submit your BEST business article to be included in my soon-to-be released FREE eBook entitled, “Take Your Business to Levels Thought Unreachable”. Creating eBooks that are full of valuable information is a BIG part of what I do online and I’d like to give you an opportunity to be a part of the process. This is an especially great PR opportunity for those with business blogs and networks and those who offer small business consulting services. This eBook will be compiled of advertorial submissions. An advertorial is an advertisement in the form of an informational editorial designed to offer valuable information, and at the same time promote your website/blog. I am essentially giving you the opportunity to purchase ad space in my eBook, in the form of an information article. I’m looking for business articles on topics such as marketing, branding, publishing, working at home, social media, sales, website design, and time management. Include “About the Author” section at the end of the article – maximum 3 sentences long with website url. Your article CANNOT be a sales letter to promote your business, product, or service. Your article must be in the form of an informational piece, showing the reader how to do something business related or how something business related works. The “About the Author” section included after your article is where your business information (website, email, product and/or services) will be shared. This is an advertising opportunity and as such there is a nominal fee. Once your article is approved, you will get featured in an eBook for entrepreneurs. 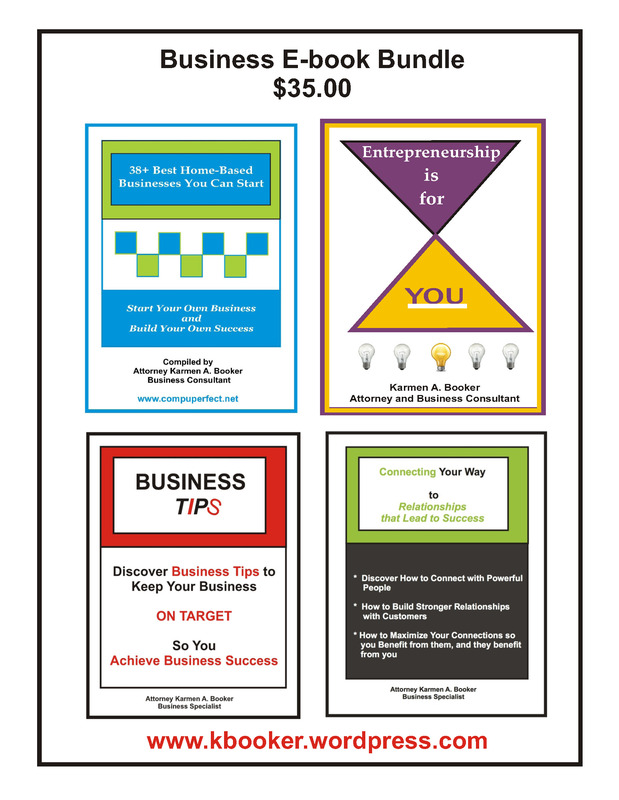 This eBook will be freely distributed to the subscribers of my business blog, business social networks, which combined have 10,000+ members. This is your chance to gain more exposure and promote you business to my unique circle of entrepreneurs. This is an especially great PR opportunity for those with business blogs and networks, and those who offer small business consulting services. Statistically, speaking, I have found people res pond better to information sharing than they do to blatant advertising, which is why article marketing is one of the best marketing strategies online. When people value what you say they will find value in what you sell. Do you need more people to find value in what you do? Submit your article to kbooker533@gmail.com and put ADVERTORIAL in the subject line. There is no way to eliminate all the risks associated with starting a small business. However, you can improve your chances of success with good planning and preparation. A good starting place is to evaluate your strengths and weaknesses as the owner and manager of a small business. Carefully consider each of the following questions. Are you a self-starter? It will be up to you – not someone else telling you – to develop projects, organize your team, and follow through on details. How well do you get along with different personalities? Business owners need to develop working relationships with a variety of people including customers, vendors, staff, banks and professionals such as lawyers, accountants or consultants. Can you deal with a demanding client, an unreliable vendor, or cranky staff person in the best interest of your business? How good are you at making decisions? Small business owners are required to make decisions constantly, often quickly, under pressure, and independently. Do you have the physical and emotional stamina to run a business? Business ownership can be challenging, fun and exciting. But it is also a lot of work. Can you face 12-hour work days, six or seven days a week? How well do you plan and organize? Research indicates that many business failures could have been avoided through better planning. Good organization of – financials, inventory, schedules, production – can help avoid many pitfalls.